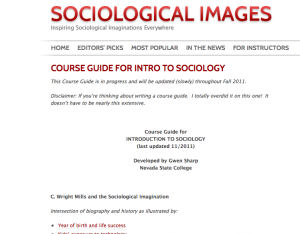 Here’s a link to another awesome compilation of Soc Images content for an Introduction to Sociology course, Developed by Gwen Sharp, Nevada State College. Teaching Sociology of Gender this semester? 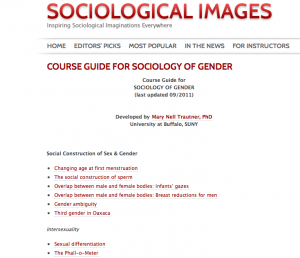 Came across this fantastic compilation of Soc Images content for designing a Sociology of Gender class, developed by Mary Nell Trautner, PhD at University at Buffalo, SUNY. The article discusses pedagogical rationale for making use of online media resources, as well as types of materials that can and should be used, locating and delivering programs and clips, as well as technical issues, like copyright obligations. The piece also deals with some of the most common problems that instructors and students have when using online materials. a group blog Jenn Lena created for a class project, My Sociological Imagination. Each week, different teams of students were responsible for posting to the blog and for commenting on one another’s posts. Mrs. Castelli, a high school teaching outside Chicago, has links to blogs written by her students. Privacy. On the one hand, having a fully public blog has many advantages: it can motivate students to do their best work because they know people will actually read it, it can draw the attention and participation from those outside your class, etc. On the other hand, this may make many students uncomfortable. For example: think back to a writing assignment you had as an undergraduate. Would you want someone to google your name today and have that assignment pop up? One option is to make the blog entirely private: only you and your students can read the blog. Another option is to require/encourage your students to use nicknames on the blog. So, at least when it comes to blogging, the kids are all right. And maybe I shouldn’t be surprised. After all, these kids have never known a world without the Internet. Putting your ideas about sociological concepts out there in a blog for the world to see isn’t much different from creating and customizing your page on MySpace of Facebook. Now if only they could learn to use their spell-checkers. We’ve been big on videos lately, but what can we say: online video is booming. You may be familiar with TED: a conference about Technology, Entertainment and Design, though really there are talks on just about every topic. The best part: the talks are all online for free. 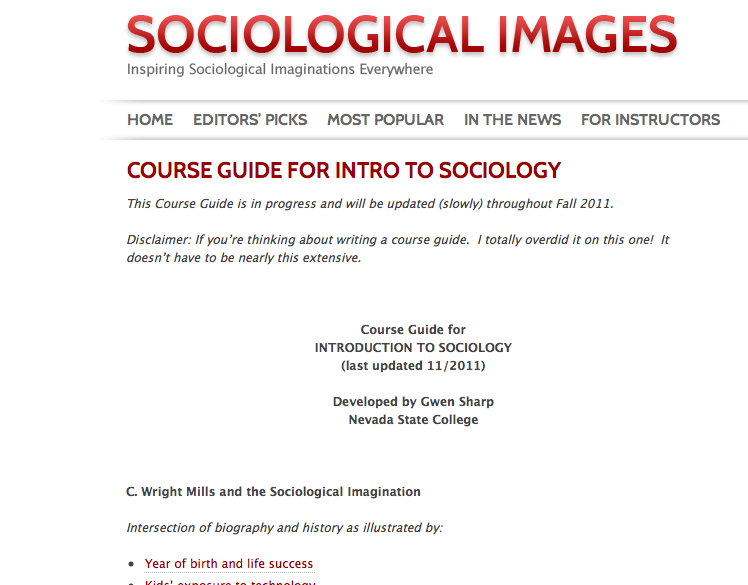 Of course, all of our blogs make for great classroom material, but our newest blog, Graphic Sociology, is particularly good for teaching. It’s especially useful for courses on research methods and the presentation of data. Graphic Sociology is run by Laura Norén, a PhD candidate in sociology at New York University. Laura’s research is on the impact of design on social behavior and she’s also co-founder of a web design company, so she’s a good person to listen to on this subject. The great thing about Graphic Sociology is that the posts work on many levels. Undergraduates and non-sociologists can appreciate it because the information presented is fascinating and the discussion of how the graphics can lead and mislead readers makes for a good exercise in critical thinking. If you’re teaching a course on research methods, this blog is a great resource for classroom material. For graduate students, sociologists or anyone else who has to present data as part of their job, the blog is a great place to learn what we’re doing wrong and to get ideas for how to present our data in new, more powerful ways. For example, you may not care about web browser market share, but you may be interested in the cool technique for representing data over time used in that graphic. Last week, I posted about using podcasts in the classroom. This week I want to share a few relatively new websites designed for sharing academic talks. Academic Earth isn’t the only site like this: also check out BigThink and Fora.tv. Of course, “iTunes U” and the iTunes podcasting section has lots of useful stuff as well. Is a recording of a lecture a substitute for the real thing? A new study by psychologist Dani McKinney suggests that the answer may be “Yes.” (via New Scientist). In fact, a podcast of a lecture may be better. Students watching a podcast can pause and rewind through missed points, they can pick their strongest time of the day to focus, and they can wear headphones to tune out distractions. Just as students can stumble into a lecture hall and nap in the back row, simply listening to a podcast isn’t as important as how the students use the podcast: students who listened to the podcast one or more times and took notes while listening actually scored better on the test than students attending the lecture. All the usual disclaimers apply: this was just one study of only 64 students, in one lecture, with one test. However, it does encourage us to take a closer look at podcasts as a powerful tool for teaching. Podcasts are like radio or television shows you can download to your computer and listen to or watch wherever and whenever you want, on your computer or on a portable player such as an iPod. All you need to start podcasting is a podcasting client, such as iTunes. If you want to hear an example, I’ll shamelessly plug our very own Contexts Podcast. We release episodes every other week and each episode features an interview with leading scholars—frequently authors from our magazine—and discussions of our favorite discoveries. Each episode is about 20-25 minutes long and are great to listen to on your daily commute or even to assign to your students to compliment your own course material. On our podcast homepage we have links to many other podcasts listed in the sidebar that you may find interesting. If you find other good ones: let us know & we can recommend those too! But this post started with a study of podcasting lectures themselves, not just using them as supplementary course material. But podcasting your own lecture isn’t that hard, and some sociologists are doing it already, such as Gianpaolo Baiocchi’s Sociology of Race Relations (iTunes link), and Tina Fetner’s Intro to Sociology (iTunes Link). Remember the study’s findings though! Encourage your students to listen to each lecture twice, or at least go back to the parts they struggled with later. Also, the students who did the best had printouts of slides to follow along with as well. And they still took notes, even though they weren’t in the physical class room. Many instructors are now using PowerPoint to present lecture material, integrate technology in the classroom, and project videos for their classes. Below you will find some useful tips and tricks compiled by University of Minnesota PhD candidate Jon Smajda, also the Web Editor of Contexts Magazine. Use the Dual Monitors mode in Powerpoint: Ever wished you could look at your own notes on your laptop screen while keeping the Powerpoint presentation up on the projector screen for your students? You can do this! You have to enable Dual Monitor mode on your laptop and Powerpoint and then you put the Powerpoint slide on one “monitor” (the projector screen) and have your own laptop monitor free to do whatever you want. Here are the instructions: http://www.onppt.com/ppt/article1026.html. Navigating to a specific slide: Say you’re on slide #12 and you want to go to your web browser to show the class a website or you want to bring up a Word document to show the class. When you go back to Powerpoint, you select View Show from the Slide Show menu and you’re right back at slide #1. Then you have to quickly cycle through each slide to get back to slide #12. There are three ways to avoid this. First, before you enter slideshow mode, instead of using the menu use the tiny “Slide Show” icon in the bottom left corner of your screen (its icon looks like a projector). If you click this, you’ll be taken straight to the slide displayed in your editing mode window, not the first slide. Second, while you’re in slideshow mode, if at any time you type a number and click return you’ll be taken to that slide: so “12 return” takes you to slide #12. Third, if you right-click anywhere on the screen while in slide show mode, and go to the “Go” menu you can go straight to any slide that way. Drawing on the screen: If you type control-p (or command-p on macs) while you’re in slideshow mode, you’ll get a pen icon. You can then draw on the screen. This is helpful if you’re looking at graphics or lots of text, for example, and want to draw attention to one element (or if you simply want to pretend you’re John Madden drawing out football plays on the telestrator). If you click “E” your drawings will be erased, and if you go to another slide and come back, they’ll also be erased. Blank screen: If you click “W” while in a slideshow, you’ll get a blank white screen. If you click “B” you’ll get a blank black screen. Just click W or B again to return to your slide. This is helpful if you want to move into a discussion portion of the class and don’t want everyone pretending to study your slides as a way to avoid making eye contact with you when you ask them questions. 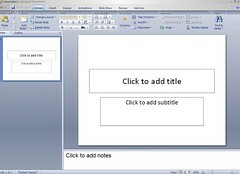 Know of other great tricks for making the best use of PowerPoint in the classroom? Comment below!